California sea lions may be chewing their way through nearly one-third of the Columbia River's spring Chinook run before the fish ever get to Bonneville Dam, according to the preliminary results of recent research by a small group of NOAA Fisheries scientists working near Astoria. NOAA researcher Michelle Rub says adult spring salmon PIT-tagged near Astoria in 2013 showed a mid-season (April 9-May 2) survival rate of 61 percent to Bonneville Dam, after harvest and turn-off effects were discounted (the fish are also genetically analyzed to determine their destination). Later in the season, survival went up to 85 percent, but overall, it averaged 69 percent for the spring. That's potentially a lot more impact than the 2-percent mortality on the spring run that other sea lions were responsible for near the dam in 2013, where the concerted effort to reduce predation has included lethal removal of some of those marine mammals. The 2013 survival results to Bonneville were the lowest seen since 2010, when the tracking study began. The 2010 results showed a 90-percent adjusted survival rate. It was 85 percent in 2011, and 82 percent in 2012. 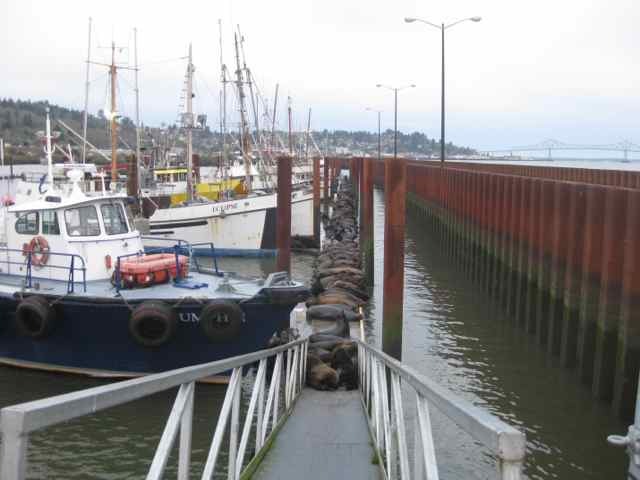 Rub said the number of sea lions in the lower river could be growing. Oregon Department of Fish and Wildlife biologist Matt Tennis said about 1,000 California sea lions were in the lower river in March and April of this year. When the smelt were running, more than 1,400 were estimated to be there, about twice the number seen in 2013. Most have since headed south to breeding grounds; only about 170 are in the neighborhood at present. The West Coast population of California sea lions has grown to over 300,000 from an estimated 10,000 in the 1950s, with help from passage of the Marine Mammal Protection Act in 1972. NOAA scientist Rub told NW Fishletter that during the initial phase of the study in 2010, some fish were tagged with both acoustic tags and PIT tags. After the acoustic-tagged fish showed the worst survival rates, the researchers suspected the sea lions might be homing in on the tagged Chinook because they could hear the pinging emitted from those tags. The following year, some fish were implanted with working acoustic tags and others with dummy acoustic tags. As expected, the spring Chinook with the dummy acoustic tags survived at the same rate as the PIT-tagged fish, but the survival rate of those fish with the working acoustic tags was much lower. The results of this investigation were published earlier this year in the peer-reviewed Journal of the Acoustical Society of America, with Rub as a co-author. The study found that in typical natural conditions, both harbor seals and sea lions could probably detect signals from the acoustic tags up to 500 meters away. The researchers also found that spring Chinook tagged in late March 2012 took about 40 days to swim the 145 miles upriver to Bonneville Dam. By early April, the migration took around 30 days. In May, the fish were heading upriver in a much more directed way, and took only about 15 days. After that, it took only 10 days for the springers to make the trip. After noting these results, the researchers said early returning stocks may be more vulnerable to both predation and lower-river commercial and sport harvest compared to later migrating fish. The NOAA researchers say their tagging study can not only produce estimates of salmon mortality by pinnipeds, but could also provide estimates of run timing and residency time of upriver stocks in the lower river. They said harvest managers could also use the sampling information to estimate inseason run strength, and track progress of the adults through the hydro system via the region's PIT tag information system, to help develop run updates for harvest management. In 2015, they said genetic testing will make it possible to identify hatchery Chinook released above Bonneville Dam back to their parents. Funding for the lower Columbia adult tagging work comes from NOAA's Cooperative Research Program.